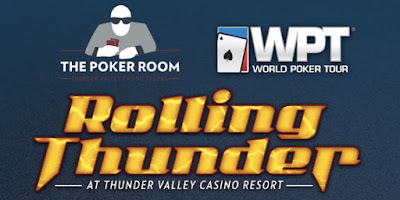 Registration has closed on @WPT Rolling Thunder $3,500 Main Event with 57 players taking advantage of the single Day 2 entry. This brings the total to 440 entries - the 2nd largest Rolling Thunder Main Event in its 5-year history. The official prize pool and PayTable is going to post shortly. Play continues today for 6 more hour-long levels, the tradition of the Bag-n-Tag taking place at 8:45pm at the end of Level 16. There's a 15-hour-long dinner break after that, Day 3 starting Monday at noon and playing down to the final table. a LiveStream for the final table is planned to begin Tuesday at noon in the poker room, audience seating available.